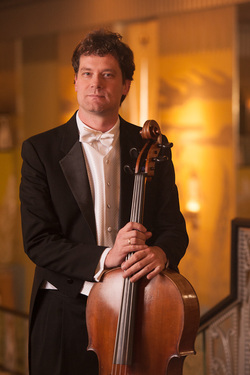 Johannes Kleinmann, cellist in the Spokane Symphony and Principal Cellist of the McCall Music Festival, is a native of Germany. He finished his undergraduate degrees in cello performance and cello pedagogy at the Musikhochschule Freiburg, studying with Adriana Contino. Additionally, he holds a Master of Music degree from Louisiana State University where he studied with Dennis Parker, and a Doctor of Musical Arts degree from the University of North Texas, where he was awarded a teaching fellowship and studied with Eugene Osadchy. Being an active performer and teacher, he is currently one of the founding faculty of Music Innovates in Spokane, where he is providing "El-Sistema" based musical instrument instruction for many "in-need" students. He is also a faculty of Holy Names Music Center, is a string coach of the Spokane Youth Symphony and has a private cello studio in Spokane Valley.